At the secondary grade levels, AVID is an approved elective course taken during the school day. Students are usually selected to enroll in an AVID class after an application process. 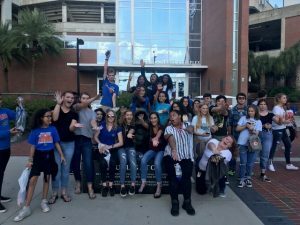 For one class period a day, they learn organizational and study skills, work on critical thinking and asking probing questions, get academic help from peers and college tutors, and participate in enrichment and motivational activities that make college seem attainable. Students enrolled in AVID are typically required to enroll in at least one of their school’s toughest classes, such as honors or Advanced Placement®, in addition to the AVID elective. As students progress in AVID, their self-images improve, and they become academically successful leaders and role models for other students. If you plan on coming to Busch Gardens (combined AVID and IB trip), here is the info you need. The trip is Thurs, Feb 14. The cost is $95. If you have an annual pass, you only pay $30 for the charter bus. Payment must go through SchoolPay and forms must be returned to Mr. Higgins or Ms. Masiak. Want to apply for AVID for the 2019-2020 school year? Need to print a blank TRF? Click below.